A true story that is touching, tender and terrific. What’s in an age? For Peter Turner, an aspiring young English actor and Gloria Grahame, a Oscar-winning Hollywood Black and White film star almost thirty years his senior, nothing at all. The film flips back and forth between 1979 and 1981, with Turner meeting Grahame in a boarding house in London. 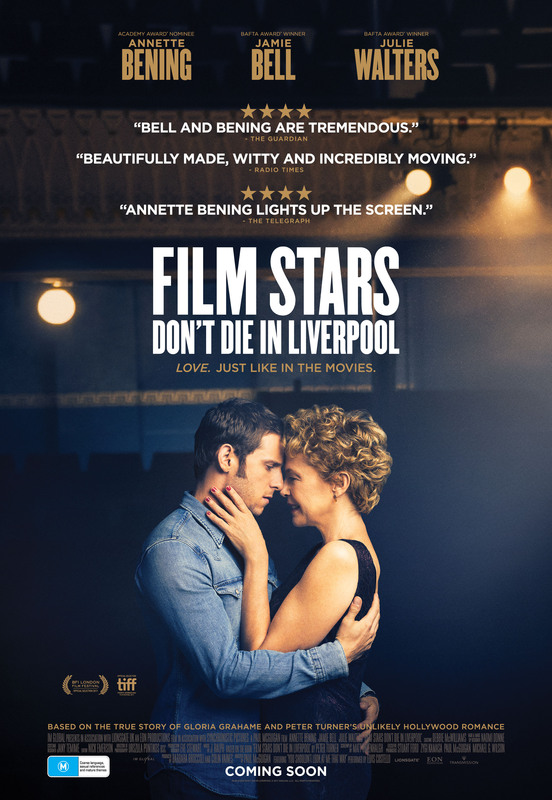 She invites him to her room for a drink and to practice dance moves from Saturday Night Fever before the pair embark on a two year love affair that only ends when illness forces them apart. Turner’s memoir is faithfully adapted for the big screen by Matt Greenhaigh, who penned the screenplay for”Control”, the incredible 2007 biopic on Joy Division’s Ian Curtis as well as “Nowhere Boy” a film, about the early years of John Lennon and The Look of Love about publisher Paul Raymond. Bening and Bell are wonderful to watch as two actors in their element comfortable with each other and able to create a genuine spark as they work with the rich material available. The film unfolds like a series of scenes from a play with simple sets, many of which are indoors with a painted background to indicate a Californian sunset or a New York City skyline. Grahame won the Academy Award for Best Supporting Actress in 1952’s The Bad and the Beautiful, and went on to earn acclaim in the early 1950s before her career went into decline in tragic conditions. Insecurity about her looks and a string of failed marriages as well as poor casting choices left her out of the spotlight from her mid-30s until her death in 1981. This film focuses on the two year relationship between the couple and features some powerful scenes as they start their romance and struggle to keep it alive once Grahame returns to the US. The films builds to one scene that unfolds on the stage of a legendary theatre in London, providing a much needed emotional release, finally paying off the time spent circling the walled fortress of Grahame’s personality, built up over a lifetime in the glare of the spotlight and decades of mistreatment at the hands of herself and her loved ones. When Grahame utters the line “People have been walking out on me my whole life Honey”, we get a sense of the layers of disappointment simmering below the surface of her screen goddess image. The film is truly powerful when the leading lady is at her most vulnerable, allowing Turner to play a role in their relationship that he is denied when she is performing for the public. The supporting cast of Julie Walters and Stephen Graham as well as Vanessa Redgrave are tremendous and this is a tight woven tale of two lovers who refuse to let age come between them.